In line with the annual Faith and Culture Symposium, Belmont will host “Living in a Global Community: Faith in Dialogue” February 22-26. 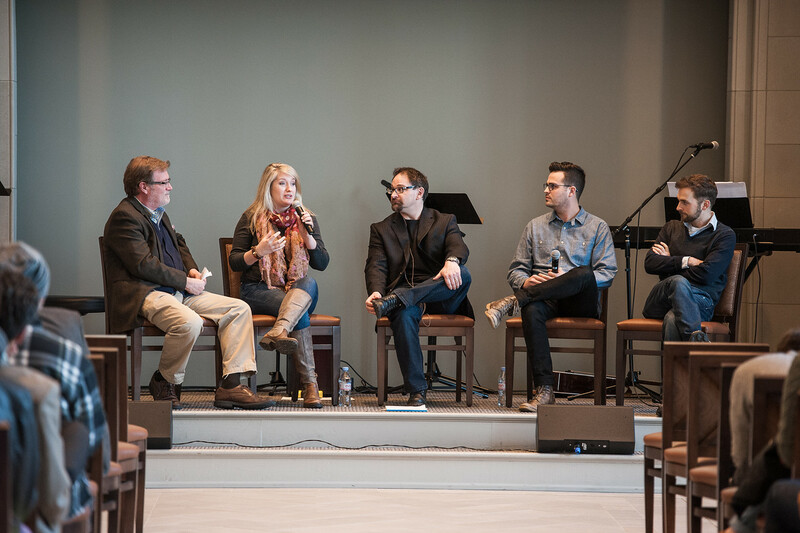 Hosted and developed by the faculty of the College of Theology and Christian Ministry (CTCM) , the symposium seeks to create campus-wide conversations about the intersections of faith and the world. Dr. Andy Watts served as chair of a faculty committee composed of Drs. Sally Holt, Mark McEntire and Beth Ritter-Conn that prepared this extensive week-long series of events. The symposium seeks to create conversations about the way religion and faith impact culture. From a discussion on the state of religion in America to the role of hymns in worship, the events will offer something for everyone. Chapel presentations include national authors such as Diana Butler Bass who will discuss her new book, Grounded: Finding God in the World; Rev. Ali Lutz, an Episcopal priest who has served parishes in Haiti, Phoenix, Arizona and Nashville; Dr. Johnny Hill, associate professor of religion and philosophy at Claflin University and author of Prophetic Rage: A Postcolonial Theology of Liberation. All events are free and open to the public, and Belmont students will receive Christian Faith Development convocation credit. Please see below for specific event, details, times and locations, or visit the Symposium website. Diana Butler Bass is one of the leading observers of religion and its place in American culture. Her new book, “Grounded: Finding God in the World” describes a new sense of spirituality she sees emerging in American culture that is not defined by the institutional church as in past generations. This film looks at the events leading up to the Taliban’s attack on Pakistani schoolgirl, Malala Yousafzai, for speaking out on girls’ education. She eventually speaks to the United Nations and later is awarded the Nobel Peace Prize. There will be a question and answer session following the film, led by Dr. Beth Ritter-Conn.
Dean of the College of Theology and Christian Ministry Dr. Darrell Gwaltney will host a panel discussion with Dr. Ossama Bahloul, Imam of The Islamic Center of Murfreesboro, and Rabbi Philip “Flip” Rice of Congregation Micah in Nashville. They will reflect on creation, scripture and living ethically. Rev. Lutz is an Episcopal priest pursuing a doctorate in Ethics and Society at Vanderbilt University’s Graduate Department of Religion. Her scholarship grows out of her experience working for many years in rural Haiti with a global health organization called Partners In Health. Diana Butler Bass’ new book, Grounded: Finding God in the World, describes a new sense of spirituality Bass sees emerging in American culture that is not defined by the institutional church as in past generations. Diana Butler Bass is one of the leading observers of religion and its place in American culture. Keith and Kristyn Getty occupy a unique space in the world of music today as preeminent modern hymn writers. In reinventing the traditional hymn form, they have created a distinguished catalogue of teaching Christian doctrine and crossing genres by connecting the world of traditional and classic composition with contemporary and globally-accessible melodies. Dr. Johnny Hill is author of the new book, “Prophetic Rage: A Postcolonial Theology of Liberation” as well as “The First Black President: Barack Obama, Race, Politics, and the American Dream.” He is Founder and President of The World House, an interfaith coalition of faith leaders from diverse religious and cultural traditions working together to continue Dr. King’s dream of racial and economic justice.